They began as a trickle, $1,000 here and $1,000 there, for extra work that the bosses insisted they deserved extra pay for. But with each passing year, the numbers grew from a few thousand bucks in 2011 to more than $30,000 in 2015. It could be called a bonus, but in governmental parlance, and according to the top officials at the Unified Fire Authority who, combined, have received $411,500 in extra pay over the past five years, it's called an "incentive." In 2015, Michael Jensen, chief of the Unified Fire Authority (UFA), which provides fire protection services to the unincorporated areas of Salt Lake County and also contracts with several townships and cities, received $34,000 in incentive pay—a big pad to the $260,488 in total compensation he already received to be the chief. Along with Jensen, UFA Deputy Chief Gaylord Scott also received a $34,000 check; so, too, did Karl Hendrickson, UFA's legal counsel. Shirley Perkins, the former chief financial officer at UFA, also received $34,000. Since 2011, all four of these individuals raked in more than $100,000 apiece in incentives. And according to documents obtained from UFA through an open-records request, all four of these officials used identical reasons to justify the additional pay, which each of them has been receiving in varying amounts since 2007. On the bottom of each payment sheet is the signature of Jensen, and in the case of his incentive payments, a signature of either the chair or vice chair of the Unified Fire Service Area Board—a position that rotates among elected officials whose jurisdictions utilize fire services through the UFA. By only having to secure a single signature to receive the extra money, the incentives had, until August 2015, gone unnoticed by several UFA board members, including the mayors of Cottonwood Heights and Holladay. 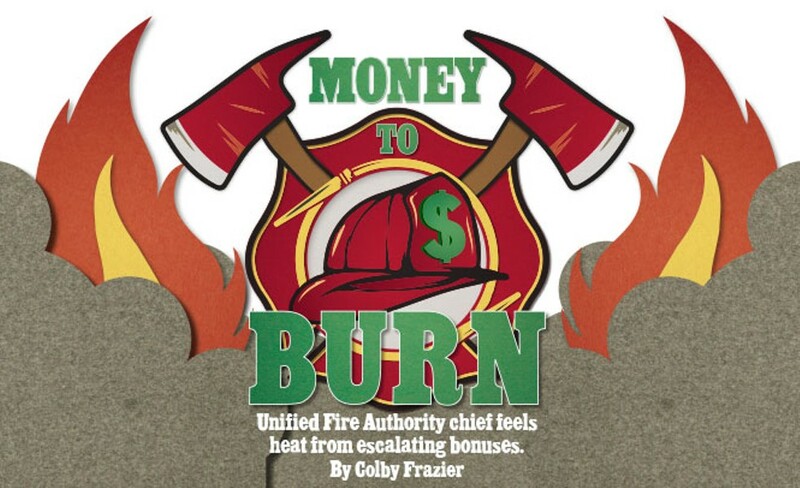 Revelation of the incentives has created a ripple effect of changes in how top UFA brass may collect any additional pay, and has also led some UFA board members to question how their fire chief, who oversees a firefighting operation of 683 employees, had time to work a $34,000 job on the side in 2015. Firefighters and the union that represents them say the extra pay also has eroded employee morale. "I feel that the fire chief and the assistant fire chief's sole responsibility is management of UFA and there shouldn't be any side deals that allow them to receive extra pay," says Holladay Mayor Robert Dahle. "It basically is an indication that [the UFA chief] is a part-time job; you've got time to go do this other stuff and get paid seperately. We don't see it that way." The incentives, which in 2015 totaled $136,000 between the four UFA officials, are the symptom of a complicated government structure that involves multiple cities, townships and Salt Lake County. All of these jurisdictions buy into the UFA for fire and other emergency services, but a key distinction lies in how each entity pays the bills. 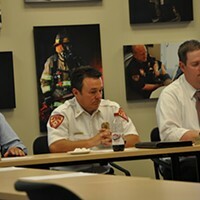 While the cities of Cottonwood Heights, Holladay, Draper and Alta are members of the UFA and are billed each year, Eagle Mountain, Herriman, Midvale, Riverton, Taylorsville and all other unincorporated pockets of Salt Lake County comprise what's known as the Unified Fire Service Area (UFSA). Members of the UFSA pay for fire services through property tax levies. For all intents and purposes, there is no distinction between the various towns: They are all members of the UFA, and receive UFA-quality emergency services. But Jensen says critical differences have emerged between the management of the UFA versus the UFSA, which have warranted the incentive pay for he and his colleagues. Not only has Jensen and other UFA officials earned their keep, Jensen says, his services are a bargain. Just over a decade ago, Jensen says, the county handled the management of the UFSA and, in the final year of this arrangement, billed the UFSA more than $565,000 in administrative fees. For years now, Jensen says the UFSA board has benefited from his expertise as fire chief, and has saved money by employing he and Scott as the primary managers of the UFSA. "The amount of money the district would pay by going to hire their own outside people, they would pay a lot more money than what they've done by doing the incentive route," Jensen says. "And they get the subject matter experts who understand and know fire and fire-related issues." Over the past decade, the UFSA has steadily grown, adding Riverton, Herriman, Midvale and Taylorsville to its rolls. While Holladay, Cottonwood Heights, Alta and Draper own their own fire stations and have city staff to perform management functions, Jensen says he, Scott, lawyer Hendrickson and the current UFA CFO Tony Hill, must carry out management of the UFSA. These jobs, Jensen says, include lobbying the Legislature on behalf of the UFSA, securing bonds to build new stations and buy land, overseeing the construction of these stations and performing myriad tasks associated with taxes. "What the district board has said is, 'We want you guys to do those [jobs],'" Jensen says. "I don't do those, though, for the other four members." But on paper, those other four UFA members don't appear too much different than the UFSA, which, although it is comprised of its own list of entities, is a member of the UFA. Dahle and Cottonwood Heights Mayor Kelvyn Cullimore say that if the UFA chief's job is being consumed by tasks specific to the UFSA, and Jensen has worked out a way to be paid for this work on top of what he's already being given as chief, it is a violation of his employment contract, which specifies that the chief must disclose any other work-related contracts outside of his job as chief. Indeed, on Dec. 15, 2015, Cullimore says an outside legal opinion was given to the board, saying that the undisclosed work, and payments, being conducted by Jensen and Scott on behalf of the UFSA violated their employment contracts. Jensen says he sought legal advice from the UFA's former lawyer in 2007, when he was deputy chief, about whether he needed to disclose the payments that were then only a couple of thousand dollars from the UFSA. The answer, he says, was no. "I'll just say I followed the advice of my attorney, UFA's attorney, at the time," Jensen says. Current UFA legal counsel, Hendrickson, who is also legal counsel for UFSA, did not respond to requests for comment. In December, the board voted on a resolution which stated, in effect, that although Jensen and Scott had violated their employment contract, the violation did not warrant any disciplinary action. The vote was 10-3, with Cullimore, Dahle and Taylorsville Mayor Larry Johnson dissenting. "Under the contracts, they can't be paid more than what the contract says without the approval of the board or the compensation committee," Cullimore says. "Either they were overpaid under the contract, which they claim was not the case, or they were paid for doing jobs for another entity which also violated the contract." Cullimore and Dahle say that as they've learned more about the incentive payment program, they have wondered how overseeing fire station construction and maintenance, planning, organizing and auditing the budget and lobbying the Legislature on matters like Medicaid and fire codes for the UFSA is above and beyond the job description of the fire chief. "UFA is the umbrella organization," Dahle says. "UFSA is a piece of UFA. It's managed under the umbrella of UFA just like Cottonwood Heights. It's just assumed that part of your management responsibility is oversight over all of your agencies." Dahle caught wind of the incentive payments in August 2015. The more he asked about them, the less he discovered, since he says no UFA board members knew they were taking place. The incentive structure, Jensen says, was put into place in 2004 to compensate UFA's CFO and legal counsel for work they had done on behalf of UFSA. Part of this arrangement required approval by the chair, or vice chair, of the UFSA board. In any given year, as the incentive packages spiraled upward, knowledge of it eluded even Cullimore, who had long been chair of the UFA's finance committee. What began as a creative way to deliver pay to those who were being asked to perform additional work as the UFSA grew, morphed into a lucrative bonus package for the chief and the deputy chief. And even as more than $400,000 in incentive pay has flowed to UFA's top-four employees over the past five years alone, few knew what was taking place. This is what prompted Dahle, in August, to notify the rest of the board. "I get where it all started, but the problem is the way it has escalated over time and the fact that the board was not fully aware that these incentive programs were in place and how much they were," he says. After the board discovered the incentive program, a freeze was placed on payments. Then, in December, Dahle and Cullimore established what they'd suspected: that the bonuses violated the chief and deputy chief's employment contracts. Cullimore also put a motion before the board that proposed to sever managerial ties between UFA and UFSA to avoid conflicts of interest. The effort failed on a 2-10 vote. But the board did end up voting to study the managerial nexus between UFA and UFSA. The board's solution to the incentive payments and management questions arrived during the March 2016 board meeting in the form of a memorandum of understanding (MOU), which outlines the details "for the sharing of services and resources between the UFA and the Service Area to assist the Service Area in the management of its operations." The MOU clearly establishes what has long been taking place: Jensen and deputy chief Scott are allowed to perform managerial duties for the UFSA in addition to their positions as chiefs at the UFA. Cullimore and Dahle both objected in the open meeting to the MOU, saying that it did little to address their concerns that the chief was working out "side deals," as Dahle described them, on top of his UFA salary. "I want a clear line of responsibility from the top down," Dahle says in the March meeting. "I don't want all these side-ways that we have to manage things that we have to figure out after the fact. That's my problem." Jensen, who, since 2000, has been a member of the Salt Lake County Council and receives $51,000 in total compensation from that position, acknowledges that the MOU was necessary in order to "draw a bright line" showing that the UFA and the UFSA are "two distinct organizations." The MOU also states that future incentive payments be approved by the UFSA board, which adds a wrinkle to the single signature that was required before. Current UFSA board chair JoAnn Seghini, whose signature appears at the bottom of the most recent incentive payments to Jensen and Scott, says that while some clarification about the payments was needed, they are appropriate. "It's much better controlled than it was," Seghini says of the incentive program under the new MOU. Seghini says it was important to initiate the MOU and preserve Jensen and Scott's ability to manage, and be compensated for managing, the UFSA. "It's not only a better deal, but it's easier for us to defend when you call, when other communities want to know why, and when we look at the services we're getting that are specific to our needs as we grow," she says. In additional to full board approval, Seghini says the chief will now have to submit the number of hours he works on tasks for the UFSA, which she says is growing while some areas of the UFA are not. While board members and Jensen attempt to decouple the UFA and UFSA into two distinct organizations when it comes to incentive pay, UFA firefighters do not have the same luxury. They are not paid extra for going on calls in UFSA areas; the UFSA, like Holladay and Cottonwood Heights, are members of the UFA, period. "It's seamless," says one firefighter who, citing fear of reprisals from upper management, was granted anonymity. "We'll work at one station that's in a UFA contract city and it could be in the same shift, we could go cover an area that's in the [UFSA]. That's one organization and that's how it's established. There's no increased work. That's a smokescreen. It's the same job, there's no different anything." As Seghini explains the UFSA incentive payments, she touches upon a nerve that, Dahle says, has the potential to end up splintering the UFA. 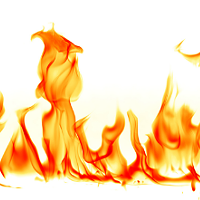 Members of the UFSA, she says, pay more for fire services, and according to Jensen, UFSA members receive better service as a result of that money. From a pure economic standpoint, Seghini says UFSA is saving money by having Jensen and Scott get the job done. According to Jensen, the UFSA's tax base accounts for more than 80 percent of the UFA budget, and 22 of the 28 fire stations are within UFSA boundaries. And it is within the UFSA areas where future growth is the brightest. To this end, Jensen says that a few years ago, he built seven new stations and bought property for five more. And he says he pores over community master plans to plot locations for future stations. "The actuality is that it requires those of us who need more right now to pay a little bit more so we can have the things that we need," Seghini says, noting that to simply raise Jensen's UFA salary wouldn't be fair to the communities that aren't growing as rapidly. Dahle and Cullimore, though, aren't impressed by any of this. If the UFA chief doesn't have enough money, he should ask for more during the public budgeting process. And if the chief and deputy chief—bona fide full-time positions—have time to perform extra work on the side for the UFSA, which, in the context of incentive pay, seems to distance itself from the other members of the UFA, then maybe these are just part-time jobs and should be compensated as such. "Every minute he spends doing work for UFSA is not time he's spending doing work for UFA, and yet we're paying him to work full-time for UFA," Cullimore says. "I find it interesting that he can justify a full-time salary as fire chief, a salary for UFSA and a salary for county council." Dahle says that as members of the UFSA grow in numbers on the board, it is hard to ignore the fact that the voices of non-UFSA communities become diminished. As this occurs, Dahle says it's not unreasonable to consider the possibility of breaking with the UFA and going it alone on fire services. "Will members want to consider options to go out on their own because they feel like they've lost their voice in the process and they're really not participating on an equal level to the UFSA?" Dahle asks. "I think that is a valid argument and a valid point to make." As for the MOU, Dahle says that it does little more than cover some messy tracks that, once revealed to the public, didn't pass the "smell test." "They basically took something that was really stinky and basically made it legal through the MOU," he says. The incentive payments have roiled more than just Dahle and Cullimore. According to a half-dozen firefighters City Weekly interviewed, morale at the fire department has suffered as revelation of the incentives, and their secretive nature, surfaced. Jeremy Robertson, president of the IAFF Local 1696 union, which represents 90 percent of UFA firefighters, says the union has not been involved in any contracts between the UFA board and Jensen and Scott. "The issue of incentive awards compensation is a contentious topic that has eroded morale among firefighters of Unified Fire Authority," Robertson wrote in a prepared statement. "The Chief and Deputy Chief have separate contracts from our rank-and-file firefighters." Dahle, too, says that revelation of the incentive bonuses has been tough on rank-and-file firefighters, who, he says, would have foregone a 1-percent longevity bonus in 2015 if not for the discovery of the chief's incentive package. As chair of the compensation and benefits committee, Dahle recalls that the longevity bonus, given to UFA firefighters who have been with the department for more than 12 years and who have topped out on their respective pay scales, was denied in 2015 for lack of funds. But then Dahle found out that UFA's four highest-ranking employees were set to give themselves a bonus of about the same amount that would have covered the entirety of the longevity bonuses. "It's very hard on morale in organizations like this when you tell them you can't afford to pay a longevity this year because we don't have the money in the budget, but we can afford almost the exact same amount in an incentive package to the top four individuals in your organization," Dahle says. "That's just not right." As a result of the incentives to the chief and top staff, Dahle says the topic of longevity bonuses was reopened and they were ultimately granted. Jensen says that the incentive pay he receives through UFSA is based on work that he actually performed, as opposed to a bonus. As a result, he says any animosity surrounding the lack of longevity bonuses in the face of his $34,000 incentive is "a matter of perspective. It's a matter of education." As for crumbling morale at the fire department, Jensen says his firefighters are known to be opinionated, and that he's not surprised he's not loved by everyone. "I get it, there's different perspectives. Some people are going to like me, some people aren't going to like me," Jensen says. "There are people who will stand by you no matter what, there are people who will be negative no matter the reason. I think I do a good job. Look at the UFA's success. I would like to think I've had at least a small part in that growth and success over the years." Multiple firefighters that City Weekly spoke with said that speaking out against abuses in their own department was a decision they arrived at with reluctance. Firefighters, they say, are extremely loyal and are known for handling conflict, and keeping dirty laundry, in house. Like Dahle and Cullimore, these firefighters, who requested anonymity for fear of reprisals, question the validity of Jensen's justification for the raises. While Jensen insists he and his top lieutenants are doing robust work for the UFSA, some see it as little more than the chief doing his job. For example, it's not as though when Jensen asked for $5,000 a piece for himself, Scott, Hendrickson and Perkins for a land purchase in Taylorsville, and construction and maintenance of the new station, that any of them were installing the plumbing and ensuring that the roof wasn't leaking. "I can just tell you that perception is reality in the fire service and the perception is that they're getting paid to do things that is an assumed responsibility by the rank and file," one firefighter says. "And then when you try to hide it, and I'll be blunt, they tried to hide it and it got out, that just makes it even smell worse." Jensen points out that he has the support of his board. With the exception of Dahle and Cullimore, the board has voted against reprimanding the chief for violating his UFA employment contract and, through the MOU, has carved out a path to continue receiving incentive payments. The board, Jensen also says, voted favorably—10-2—to allow him to seek his fifth four-year term on the county council—a job that has, in previous years, drawn fire from some of his Democratic opponents who say that Jensen's elected role and firefighting job runs afoul of the Hatch Act, which prevents individuals who manage federal funds from serving in elected office at the same time. These attempts to swat Jensen down have been unsuccessful. But Jensen's many hats, and his lucrative compensation, makes Dahle wonder if his full-time fire chief is actually doing the work of a full-time fire chief. "When you say that you're doing all of this separate work and you should be paid extra, who's watching the shop then while you're doing all of this extra work?"